ST. LOUIS - There was enough UConn gear around Chaifetz Arena on Tuesday to know that one of this city’s favorite daughters was home. But while many in the stands had watched her and followed the basketball career of Napheesa Collier at Incarnate Word Academy, it was the first time they had seen the senior forward representing the Huskies in their national flag blue and white. And you don’t get a second chance to make a first impression. UConn came, saw, and returned to campus satisfied following a successful trip. Collier, a resident of nearby St. Charles, recorded her personal-best fourth consecutive double-double with 22 points and 11 rebounds Tuesday as the top-ranked Huskies rolled past Saint Louis 98-42 before a crowd of 7,105, the third-largest in Billikens’ history. Forty-eight hours after rolling past reigning national champion Notre Dame to take over the top spot in the Associated Press poll, UConn (8-0) could have won on talent alone against Saint Louis (4-5). But even with the attention on Collier, the Huskies also kept their focus and put in the work necessary to win in style. “If you’re a college basketball player and you’re on the road for five days and you have two games in three days, this isn’t high school or junior high,” UConn coach Geno Auriemma said. “So if we had played lousy tonight then that means we’re no better than a junior high team. Collier was the center of attention. The three-time state champion and two-time state Gatorade Player of the Year at IWA received a loud ovation when she was introduced and scored the game’s first basket. She finished 10-for-17 shooting from the floor, though her 2-for-6 effort at the foul line was pretty forgettable. She added two assists, two steals, and two blocked shots. Her teammates were not quite buying that. “She missed some shots she makes easily sometimes but she rebounded well and did all the things we count on her to do,” All-American Katie Lou Samuelson said. If Collier, who had her IWA number retired in a ceremony at the school Monday night, was struggling it didn’t show in her demeanor. She came out for good to another loud ovation with 8:52 remaining and was all smiles on the bench as she sat between Samuelson and Dangerfield. “Some people are what you see from the outside,” Auriemma said. “Pheesa doesn’t really have a range of emotions. She stays on a pretty level plane every day, every practice, every game, every situation. Last night was a perfect example of that. She was pretty much the way you always see her. There was no over-the-top reaction. She was low key. The people did a phenomenal job and it was a great night for her and her family. UConn has won 88 consecutive games against first-time opponents dating to a loss to Georgia on Jan. 15, 1996, eight months before Collier was born in Jefferson City, Missouri. 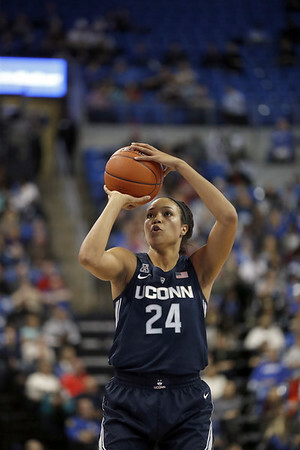 The Huskies will play their final game before fall semester final exams Saturday when they host former Big East rival Seton Hall at the XL Center in Hartford. Sophomore Megan Walker did not play Tuesday due to a fever, forcing Auriemma to alter his starting lineup for the first time this season. So after coming off the bench 67 times, Kyla Irwin made her first start and she finished with two points and a career-high 10 rebounds in a career-best 25 minutes. Another beneficiary of Walker’s absence was Olivia Nelson-Ododa. The freshman followed up on her fine effort at Notre Dame Sunday with her first double-double (12 points, 10 rebounds) in 23 minutes.